This book is ideal for cricket captains at all levels, and is a specific help to those at both school and club level. Author Wesley Durston was a county cricketer and former captain of Derbyshire CCC with 17 years of experience, and co-writer Patrick Latham played at Minor County and Second Eleven level. The book was written for cricket captains from all standards, from schools cricket right through to the international game, but with its focus more on the former. It covers everything from match management to fielding awareness and the Mankad law, which the authors clearly do not like. 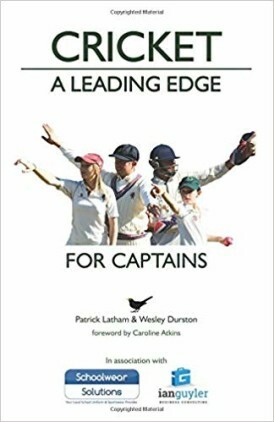 The only thing Cricket: A Leading Edge for Captains does not touch upon is the media work that is done at international level, which is fair enough, given I see the book’s main readership being at clubs and schools. The book is written in a way that is easy to understand for all who play the game, without getting too technical. As a captain it should be your bedside cricket book for referring to when you are looking either to double check the handled ball law or a field placing that will help your young leg spinner progress in the side. The authors have approached other former captains and coaches in an attempt to broaden the base of knowledge they are passing on. There are seventeen contributors including South Africa and England schools coach Van Der Merwe Genis, and former Protea Justin Ontong. Others include recent Derbyshire CCC captain Wayne Madsen, his Somerset CCC counterpart Tom Abell and minor counties cricketer Chris Park. They all share captaincy stories and advice for fellow captains. Abell, for instance, talks about how he struggled in his first year of captaincy and how he handled it when Somerset were one defeat from relegation. The book is remarkably comprehensive for one that is only 128 pages long. Importantly, it talks about the smaller things such as how to handle a new player in a new dressing room. It includes how and when to bring junior players into the side and the importance of staying calm under pressure. Patrick Latham also makes use of quite a few illustrations in the book, which he appears to have enjoyed doing. At the back of the book there are nine pages of field placings for every type of bowler, both attacking and defending, which is certainly handy for all captains to consider. I see Cricket: A Leading Edge for Captains as an important one for captains whether they lead their school’s C team or are skipper of Barnt Green in the Birmingham League Premier Division. It is certainly a book that should be used by all, but especially those at school and club level. With that in mind I give it four out of five stars.